Virtual Art Museum, Virtual Art? I note that navigation, at Google Art project or elsewhere, seems to be a ubiquitous problem. I can say from personal experience that the technology exists to do virtual museum with full free movement through the horizontal space. For the moment it would seem that this would not be a web-based game but rather a download. It would be possible to mod existing engines, like Valve’s Source engine, for free or make one using any of several different 3D engines available for licensing. Another question is what effect this type of access would have on the world? Pretty clearly it would be good for students and teachers of all ages. This kind of full access from home would simultaneously drop the barriers to art viewing to nearly zero and make this possible across geographic distances that would otherwise restrict access to the elite who can afford the trip. The democratic aspects of this are marvelous. However, like all free internet stuff, it is not immediately clear whether this is positive for anybody except the consumer. Are visitors more or less likely to visit actual museums in a world of instantaneous virtual access? Do museums require revenues from visitors or are they generally endowed by “patrons” who support any kind of exposure of art? What of books containing artwork? Will people buy expensive coffee table art books when they can download (or “collect”) art online for free – especially since many purchases are in the museum store after an inspirational visit? 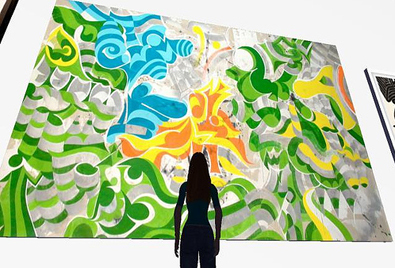 Most interesting, what art will emerge from this new virtual world? It stands to reason that virtual museums might well host virtual art – art that doesn’t exist except in virtual space. For sure, most of that art will be terrible and derivative to begin with (Mona Lisa with a goatee). But I have no doubt that, in time, art will emerge that is either or both wonderful and/or a brilliant use of virtual opportunities to make art. A criticism could be made that art made virtually is not “real” and therefore not art. However, these days, for example, most sculptors don’t “make” their art. They make blueprints and construction teams or metal specialists to make the actual art for them. If that is “art,” then, I would argue, so is this (whatever “this” turns out to be). How’s this for an art project for tech savvy older students: visit a virtual art museum and them create a piece of virtual art. The professional tools to do this are not cheap but they are not expensive in the scope of school budgets (at least in normal years). There are free downloadable tools like Blender and Google Sketchup that might provide a starting point. Younger children can share this experience with results commensurate to their age.